It may seem counterintuitive to install in a small garden a furniture set that cannot be moved/separated. However, it’s claimed that they can actually enhance the feeling of more space. Just like a built-in wardrobe allows you to fit more in the space you have as well as it being tucked away, furniture sets like our All Weather Weave Sofa Set will fit neatly against the perimeter of your space and become part of the scheme. Top tip: Add extra garden cushions to make a cosy corner sofa that brings the indoors outdoors! Rumour has it that heavier furniture will make a space look even smaller – they tend to overshadow the area if it looks very big. So, our advice is to choose furniture that looks lighter, so you’ll think it is in fact smaller. How about our 4 Seater Teak Garden Set? They are a perfect table and chairs for small spaces such as gardens, balconies or roof terraces. The comfortable Rehau® weave is much less bulky, creating the illusion of a larger garden, with more space to utilise however you wish. Just remember to maintain your teak furniture otherwise you won’t want to use your garden at all! Top tip: Tuck in the chairs for further space and/or remove them to leave a side table, great for hosting BBQs and decorating with flowers and herb plants. Top tip:Tuck in the chairs for further space and/or remove them to leave a side table, great for hosting BBQs and decorating with flowers and herb plants. 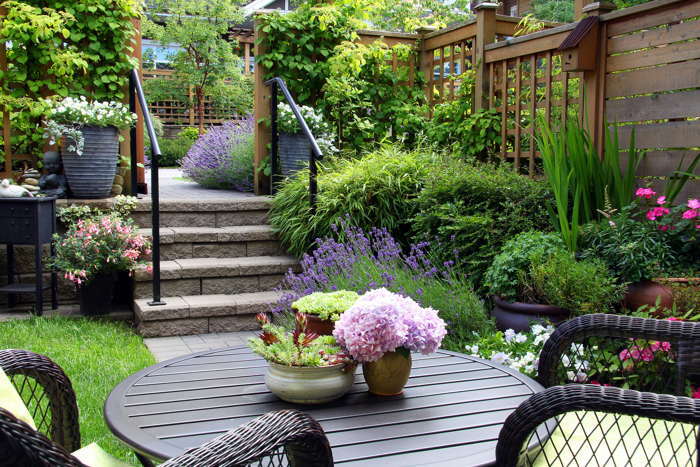 Sometimes making the most of a small garden will include drawing the eye up and away from its immediate surroundings. Some ways to do this is include vertical planters, shelves and other equipment, but our advice is to get your hands on a small garden parasol. Not only will it draw your eyes away from limited space in front of you, it will also provide shade from particularly sunny days with the ability to move it and put it down if necessary. These are the best kinds of furniture for small spaces. Top tip: Add lights to the frame of your parasol to create your very own starry night or celebration! Mishmash décor appears to be on trend right now. 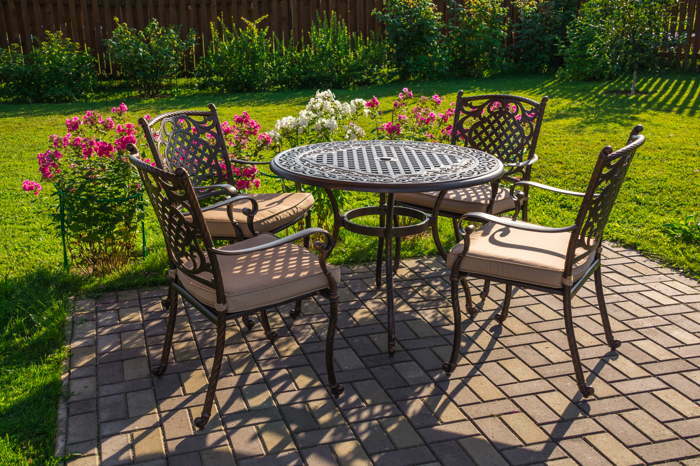 However, we advise against a random collection of garden furniture and recommend the best garden furniture for small gardens is that which matches others around it. 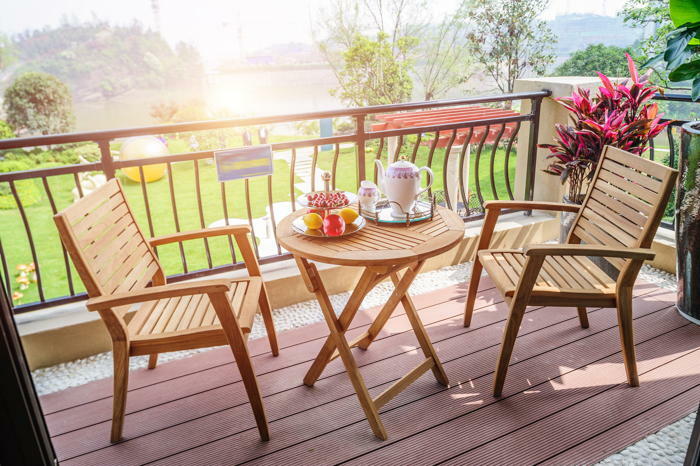 In a small space, assorted styles and designs will often make it appear cluttered and disorganised, leading to less apparent space – small garden furniture that match will appear much more spacious. This is a much better idea of garden furniture for small gardens. Top tip: Go for furniture sets with lighter colour wood and/or chairs, as lighter tends to create the impression of a more spacious area.